Logynon ED tablets are a combined oral contraceptive pill. 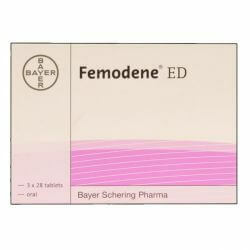 Logynon ED is taken by women to prevent pregnancy. When taken correctly, Logynon ED is one of the most reliable forms of contraception. Logynon ED is a prescription-only medication. Prevents the egg being released each month from the ovaries. Thickens the cervix fluid making it more difficult for sperm to enter the womb. Prevents the womb lining thickening enough for an egg to embed. Logynon ED is taken every day without a break. You take an ‘active pill’ each day for 21 days, followed by an ‘inactive pill’ each day for 7 days. It is a very reliable method of contraception. It can help with a variety of premenstrual symptoms. Logynon ED needs to be taken as directed in the Patient Information Leaflet in order to prevent pregnancy. In addition, Logynon ED will not protect you against sexually transmitted infections or diseases. You should use condoms for protection against STI’s and STD’s. 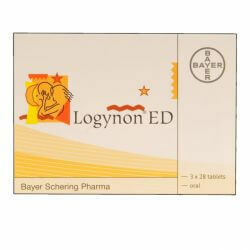 To prevent pregnancy, always take Logynon ED tablets as instructed. This pack is designed to help you remember to take your pills. The pack contains 3 foil memo strips with 3 sets of 7 self-adhesive strips showing the days of the week. Each foil memo strip contains 28 tablets: 21 small active tablets in 3 rows (6 red, 5 white and 10 ochre-coloured tablets) and 7 larger, white, inactive tablets in the last row. Take Logynon ED every day for 28 days. Stick the strip along the top of the foil memo-strip so that the first day is above the pill marked ‘start’. You can now see on which day you have to take each tablet. Follow the direction of the arrows on the strip. Swallow each pill whole per day until you have finished all 28 pills. Start taking your next strip of Logynon ED the next day. Do not leave a gap between packs. As long as you take Logynon ED correctly, you will always start each new strip on the same day of the week. For further information, consult the Patient Information Leaflet on taking Logynon ED. Each box of Logynon ED tablets contains three strips of 28 tablets (21 active tablets and 7 larger inactive tablets). 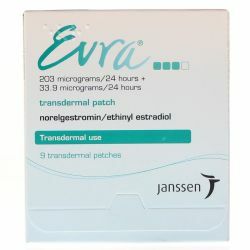 Levonorgestrel is a progestogen and ethinylestradiol is an oestrogen. Lactose, maize starch, povidone, magnesium stearate (E572), sucrose, polyethylene glycol 6000, calcium carbonate (E170), talc, montan glycol wax, glycerin (E422), titanium dioxide (E171), ferric oxide pigment (red and yellow) (E172). Before you start taking Logynon ED contraceptive tablets, it is particularly important to read the symptoms of a blood clot section in the Patient Information Leaflet. It’s important that you understand the benefits and risks of taking Logynon ED before taking it or when deciding to carry on taking it. 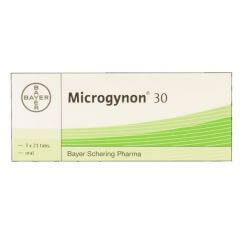 Although Logynon ED is suitable for most women with good health, it is not suitable for all. If you need an operation or if you are off your feet for an extended period of time. If you have ever suffered from a heart attack or stroke. If you have (or have ever had) angina pectoris (a condition that causes severe chest pain and may be the first sign of a heart attack) or transient ischaemic attack (TIA - temporary stroke symptoms). A very high level of fat in the blood (cholesterol or triglycerides) a condition known as hyperhomocysteinaemia. If you have (or have ever had) migraines or a type of migraine called ‘migraine with aura’. If you are allergic to any of the ingredients found in Logynon ED tablets. If you suffer from pancreatitis (an inflammation of the pancreas). If you have just given birth as you are at an increased risk of blood clots. If you have an inflammation in the veins under the skin (superficial thrombophlebitis) or varicose veins. If you or your close family have ever had problems with your heart, or circulation such as high blood pressure. If you experienced any illness that worsened during pregnancy or previous use of the Pill. Some medicines used to treat epilepsy. Some medicines used to treat HIV and Hepatitis C virus infections (so-called protease inhibitors and non-nucleoside reverse transcriptase inhibitors). Logynon ED contains lactose and sucrose. Therefore, if you have been told by your doctor that you have an intolerance to some sugars, contact your doctor before you buy Logynon online and taking Logynon ED as your form of contraception. Do not use Logynon ED if you are pregnant. If you are breastfeeding, your doctor or family planning nurse may advise you not to take Logynon ED. They will be able to suggest alternative contraception.